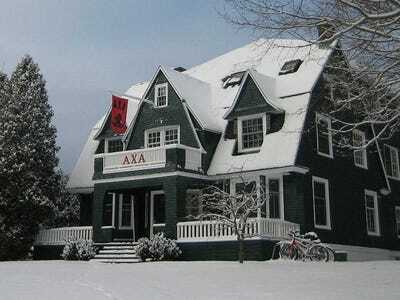 Via Wikimedia CommonsThe Alpha Chi Alpha fraternity house at Dartmouth College. A whopping 87% of Dartmouth students polled by student newspaper The Dartmouth support keeping the Greek system on campus, despite recent vocal opposition from the college’s faculty and the newspaper itself. It’s worth pointing out that Greeks appear to be overrepresented in The Dartmouth’s poll — 62% of respondents said they were involved with a Greek organisation, while 38% said they were not. About 51% of Dartmouth’s student body are members of a Greek organisation, according to the school’s website. The student newspaper recent gained attention for a front page editorial it published over Dartmouth’s Homecoming Weekend calling for the end of Greek life on campus. “We have to look past our short years here and think about the College’s future, which means eliminating an antiquated system,” The Dartmouth’s editorial staff wrote. The college’s faculty also recently came out forcefully against Greek life, voting 116-13 to end the Greek system at a meeting earlier this month. Dartmouth’s Greek system received some negative attention earlier this year with the publication of former Sigma Alpha Epsilon fraternity member Andrew Lohse’s book, “Confessions of an Ivy League Frat Boy.” In his book, Lohse details his time in a Dartmouth fraternity, revealing hazing practices and other disturbing behaviour.